Another great Two Minute Dog Tip from Wendy, all about how dogs sleep! Is your dog dreaming, or is he just taking nap? My other dog, Little Man, has to be right next to me under the covers or he will keep me up all night. Cappy, my third pup, likes to be up at the head of the bed, but under the pillow next to me. Dogs do have different stages of sleep like people do. 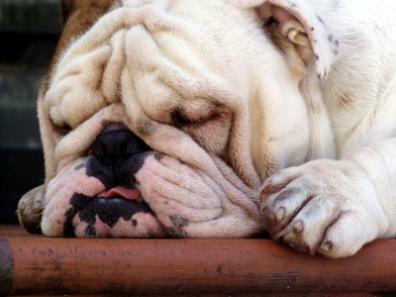 Dogs almost sleep half their life, the equivalent to 16 hours a day. The phrase, let sleeping dogs lie, holds a lot of truth. Considering 60% of dog bites happen to children when they first wake a dog in a deep REM sleep. It is important to always teach children not to approach a sleeping dog and startle. Most dogs will generally circle round and round, nesting before they finally lie down. Most of the time when the dog is sleeping on his side, or sleeping on his belly with all four paws out, he is simply dozing - although, sometimes he can go into a deep sleep on his side. This is the position where they go into a deep sleep. Certainly one of the funniest of all sleep positions, your dog is on his back with all his legs up in the air. There are two main reasons why this tends to be where the dog gets his most relaxed dream sleep. One, his stomach is exposed to the air so he is able to keep cool. Two, by not being all curled up in a ball, none of his muscles are tense, and so he is able to be completely relaxed. In this position and the side positions, you will witness most of the funny dream movements happening. Like kicking, wagging tail, nose and whiskers twitching, muffled barks, muffled cries, chewing motions, feet running, snoring, and in general bliss. At first I thought this would be the deep sleep position, but in doing my research I discovered I was wrong. This is actually a common napping position. After watching my boys this week, I have noticed they wake up very quickly from this position. Versus at night in bed when they are all spread out, I can move up and down, and they don't open a eye. Little Man, my Chihuahua, must sleep under the covers with his back next to my back. Cappy and Senator love to sleep back to back to each other. When a dog sleeps back to back with its owner or next to another dog, they are bonding; they feel safe protecting each other and it's a way of showing affection. When there is a pack of dogs they tend to sleep all together, although sometimes the alpha dog will sleep apart or in a higher position. It's important to understand your dog's sleeping habits, as even a dog can get grouchy if he doesn't get enough sleep. Have you ever been playing with your puppy and he just passes out, well he just can't help it. He needs his sleep. The temperature in a room will influence how your dog sleeps. So be sure if your dog sleeps inside or outside, that it is a comfortable temperature at all times. Dogs get hot and cold just like people. Let's talk a little bit about where your dog is going to sleep. The choice of beds and furnishings has increased drastically in the last five years. I recently saw a catalog where they sell different bedroom sets which include a bed, a mattress, a closet, a dresser, and a feeding station. I must say there were five different styles to choice from, the cottage style, the modern architecture, the new French, the Roman Empire, and the medieval times. Whichever style you choose, it is most important to have a clean comfortable sleeping area for your dog. In today's market, there are so many varieties to choose from; why not have fun and go bed shopping? And remember the next time fido or feefee, is twitching, barking, and smiling on the way to dreamland; we are probably jealously sitting at the computer saying, "Wow, wish I could take a nap."